Captain America was created in 1941 by legendary comic artists Jack Kirby and Joe Simon. Published by Timely Comics, the brand would eventually become Marvel. An American supersoldier premiering at the height of World War II tensions was an instant hit and has been in constant publication since 1964. Any hero with that type of longevity and popularity is going to spawn many different items. 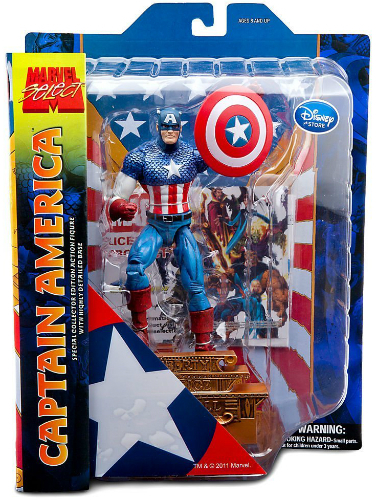 This article serves as an overall guide for new collectors to track down key Captain America collectibles, including comics, action figures, statues, and trading cards inspired by The Captain. Steve Rogers, a meek young man, is the test subject of an experimental new drug created by the United States government to aid in the war effort. The special serum enhances Rogers’ strength, speed, agility, reflexes, and recovery to the peak of human possibility. Nearing the end of the war, Rogers is frozen in ice and remains in suspended animation until being brought back to consciousness in modern times. The conflicts that arise from having 40s-era sensibilities in a modern world are part of what makes Captain America such a beloved character and one that has endured long after the lure of patriotic archetypes has diminished. Captain America has appeared in many comic books throughout the Marvel Universe and has been the subject of films dating back to 1944. His association with The Avengers has kept him at the forefront of Marvel comics since the 1960s and he is a critical component to the company’s massively successful film universe. Use the tabs above for a breakdown of the most important collectibles to have in your Captain America collection. Captain America 122 CBCS 9.8 SS Signed Joe Sinnot Signature Series WHITE PAGES! 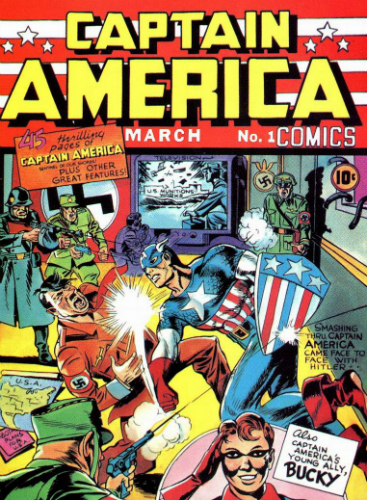 There have been several titles to feature Captain America over the decades. The list below offers a brief rundown of the comics for which he is a primary or titular character. It does not include cameos, crossovers or team-up books such as The Avengers, for which he appears in many issues. Captain America collectors should pay close attention to the many volumes of eponymous books on the market and the sometimes-confusing numbering sequences therein. The original and, obviously, most valuable of Captain America comics ran from 1941-1950. These releases, by Timely Comics, are typically very expensive, even in questionable quality, so completing this collection will be tough. The final two issues — #74 and #75 — are entitled Captain America’s Weird Tales but belong in this sequence of books. In 1954, three issues were released which continue the numbering sequence of the original series, meaning there are 78 total issues to hunt down in this volume. 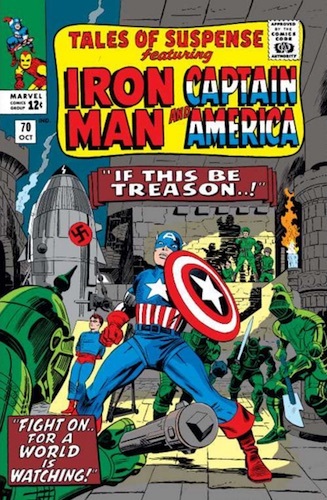 While the Tales of Suspense anthology featured many characters over the course of its 99-issue run, issues #59 to #99 center around Captain America and Iron Man who appeared in their own stories for each issue. Because this comic had been around for some time prior to Captain America’s inclusion, collectors can easily eliminate over half the books from their search if they are only interested in The Captain. Issues from the series can run several hundred dollars but rarely command premium prices since these are neither debut issues or self-titled books. Following the conclusion of Tales of Suspense, Captain America was given his own title again but the numbering of this new series picked up where Tales of Suspense left off at #100. Marvel has a long history of seemingly arbitrary sequencing, including these issues. Where it would have made sense to start at #1 or at #79, continuing the sequence from the 1954 series of the same name, Marvel opted to continue the numbering from a series that Captain America didn’t appear in until well into the second half of its run. 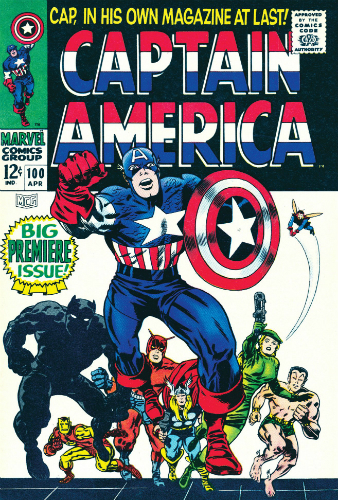 Then, in 1996, this volume ended and was replaced with Captain America, Volume 2 issues #1-13. Volume 3 began in 1998 with 50 issues released followed by Volume 4 (#1-#32) in 2002, and Volume 5 (#1-#50) in 2005. Now, to muddy the waters for collectors after the fact, the next set of releases goes back to Volume 1 (#600-#619) in 2009. Did you get all of that? Volume 6 and 7 were released in 2011 and 2013, respectively, with both starting on issue #1. Since 2015, Captain America books have been released without volume designations, including All New Captain America, Captain America and the Mighty Avengers, Captain America: Sam Wilson, and 2016’s Captain America: Steve Rogers. Regardless of the convoluted numbering scheme, there are some valuable issues tucked away on this title at varying price points. 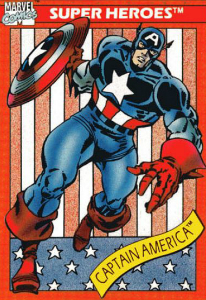 Captain America is one of the rare Marvel characters to be the central focus of trading card sets, although that distinction is growing with the broadening Marvel Cinematic Universe. This guide compiles the releases specifically branded as Captain America sets but die-hard fans will be able to hunt down cards from Marvel sets, including 1966 Donruss Marvel Superheroes, 1991 Impel Marvel Superheroes, 1992 Skybox Marvel Masterpieces. 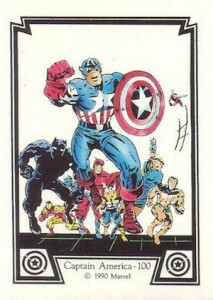 He is also featured predominantly in several sets based on Avengers comics and movies, with many of these sets including sketch cards, autographs, and relics. Released to commemorate the 50th anniversary of the character’s debut, this 45-card set compiles artwork and comic covers from some of the most iconic moments in Captain America’s history. This set is very similar in design to other Comic Images sets of the time, particularly the McFarlane Spider-Man sets. Complete sets and the occasional unopened box can be found through online auctions at a reasonable price point. Upper Deck has released a few sets based on the Captain America film franchise. 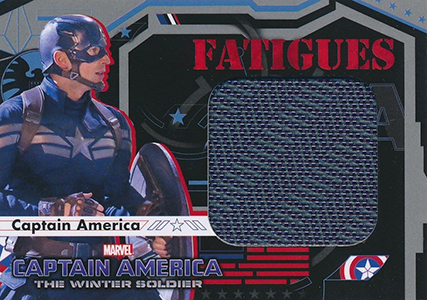 The first Upper Deck option was the 2011 Captain America First Avenger product that set itself apart by including insignia patch cards. That set was followed by 2014 Captain America Winter Soldier and 2016 Captain America Civil War. Each set has several chase inserts as well as autograph cards from actors in the films, relic cards, parallels, and original sketch cards. Upper Deck also includes Captain America in their Avengers sets. Like many heroes from both DC and Marvel, the first Captain America action figure came from Mego in the 1970s. These figures, with their various packages, costume details, and figure molds, have become quite popular. What they lack in modern day design aesthetic, they make up for with collectibility. Mego released a 12” and 8” version and, when in box, these figures can sell for several hundred dollars. ToyBiz was a longtime manufacturer of Marvel action figures and released quite a few Captain America toys under their various product lines. One line — Marvel Superheroes — was packaged in a suspiciously similar way to the populr Kenner Super Powers line of DC characters. Hasbro has released several 6” action figures in the Captain’s likeness, including a line for the 2016 Civil War series. Because of their more recent releases, these figures are much easier to track down at a fair price and make for a great starting point to any Captain America action figure collection. In addition to their collectability, Captain America statues are also beautiful art pieces and ideally suited for display. While many companies produce statues and busts of varying degrees of quality, there are a few notable standouts. Sideshow has released several detailed, limited edition statues for the character in both posed form and diorama. Some of these figures, by nature of their extreme limited availability, can sell for well over $1,000. At a slightly lower price point, Bowen Designs produces some gorgeous pieces and, at an even lower price point, Kotobukiya continues to be an affordable entry point into the world of statue collecting. 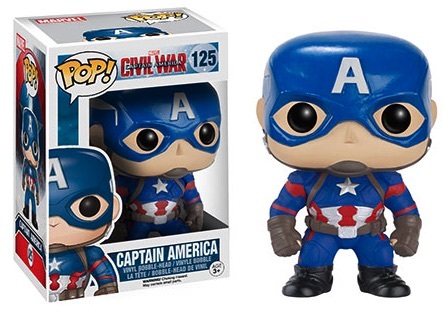 There are several different Captain America Funko figures crossing into virtually every product line they release. Alongside the standard Pop! 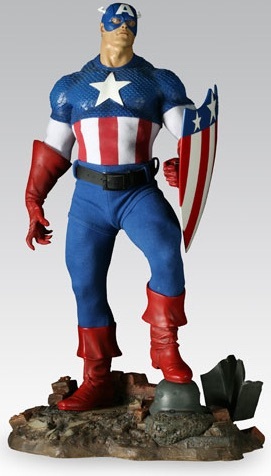 figure are figures released to commemorate all the Captain America movies as well as the Avengers films. He is also included in their line of Mystery Minis, Wacky Wobblers, and Mini Bobbleheads. Retired figures and retail exclusives from the Funko line regularly see huge values compared to their retail pricing, so collectors should not discount these figures as being cheap toys but, rather, an affordable gateway into a massively popular collectors market. I just bought a copy of tf the Captain America 50th birthday lithograph signed by jack Kirby and noticed that there are two different ones. The one I bought has gold stars but most have the pencil blk and white. My question is what is the difference? (Besides the the obvious) is one more rare?